Becher’s Brook at Aintree, the legendary Kop at Anfield, the 18th tee at Hoylake – just three hallowed Liverpool landmarks on the map of international sport. But sporting heritage on Merseyside permeates the entire region and its unique cultural legacy. 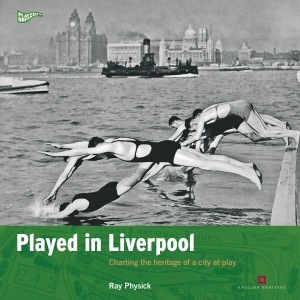 In Played in Liverpool, the fourth of English Heritage’s groundbreaking Played in Britain series, social historian Ray Physick guides the reader on an intimate tour of the city’s lesser known sporting treasures; from the site of the 19th century Liverpool Olympics on Mount Vernon and the dockside location of Britain’s first municipal swimming baths, to the football giants Liverpool and Everton confronting each other across the expanse of Stanley Park. It was in Liverpool that a canny city engineer designed football’s original goal nets in the early 1890s. Vast offices belonging to the likes of Littlewoods, Vernons and Zetters housed the headquarters of the British football pools industry. At Goodison Park we learn about the origins of the Toffee Lady, dispenser of sweets to the Everton faithful before every match. Among the old gymnasiums of Little Italy and the Victorian Lads Clubs of Toxteth – the famous and now threatened Florrie Institute to name but one – lie the seeds of a thriving, bruising boxing scene. On the Mersey we sail in the wake of intrepid swimmers and rowers. On the Wirral coast and on the links leading from the Liverpool docks to the refined seaside resort of Southport we visit Art Deco golf clubhouses and suburban tennis clubs. The Cavern Club, that ferry across the Mersey, and Scouse humour have long been celebrated in popular British culture. Now, as Liverpool prepares to act as City of Culture for 2007, it’s time to reveal its sporting secrets. Hold on to your bobble hats for a story that has never been told.